Guitar players may not recognize Joe Carr’s name at first, but his face is probably familiar. That’s because he appears in over 20 instructional guitar videos ranging from country to western swing, bluegrass and even heavy metal! Add to these his videos on mandolin, fiddle, banjo, and ukulele and Joe may be the most recorded video music instructor anywhere. Joe is a self-taught musician originally from Denton, Texas who started guitar at age 13, inspired by the folk musicians of the 1960’s. A few years later, he was hired to play guitar in Alan Munde’s internationally known bluegrass group, Country Gazette. Over the next six years Joe recorded 3 group albums, numerous sideman projects and produced his own critically acclaimed solo guitar album, Otter Nonsense. Joe left the Country Gazette in 1984 and joined the music faculty in the unique commercial music program at South Plains College in Levelland, Texas. 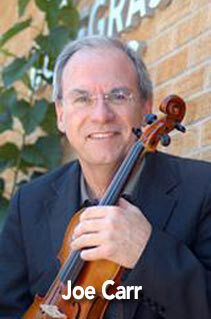 He continues to perform in duo with former Gazette leader and South Plains College colleague Alan Munde. “Alan and I have a great artistic communication that leads us into many new areas of music,” Joe says. In addition to two albums on the Flying Fish label, Joe and Alan have published an award-winning book about West Texas Country Music called Prairie Nights to Neon Lights from the Texas Tech University Press. Joe is also a regular columnist for Flatpicking Guitar magazine and writes for several other periodicals as well. For more information about Joe, visit Joe’s MySpace Page.